Amino AcidsHi Tec Amino Anabol - 200 kaps. 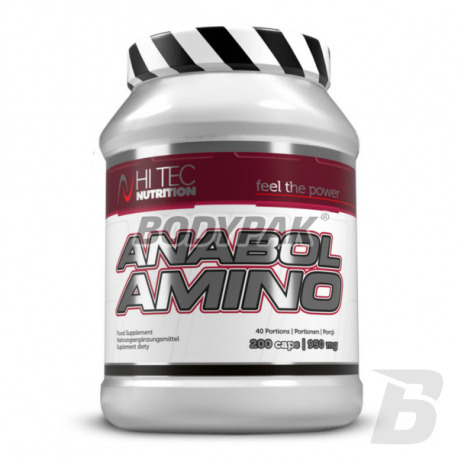 Hi Tec Amino Anabol - 200 kaps. Top-quality preparation provide the body with hard trainee athlete the right amount of branched chain amino acids: leucine, isoleucine and valine in perfect proportion with a high content of leucine (42%). 98 loyalty points Your cart will total 98 points that can be converted into a voucher of 3,92 PLN. 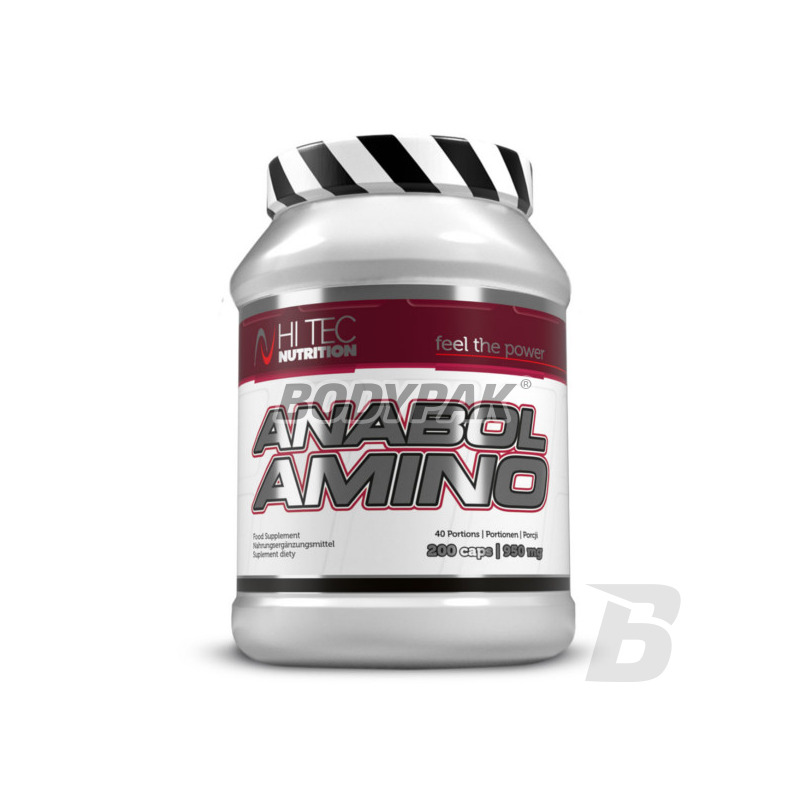 Amino Anabol is a formulation providing the body with a hard athlete's training appropriate amount of branched chain amino acids: leucine, isoleucine and valine in the ideal proportions with a high content of leucine (42%). Leucine strongly inhibits proteolytic enzymes in muscle cells, thereby reducing muscle protein breakdown during intense training and is also a key amino acid in the initiation of synthesis of new muscle proteins. Used in the preparation of L-alanine, it is used by the liver for synthesis of glucose thereby reducing the use of BCAA for the production of alanine in muscle, as a precursor of pyruvate, effectively supports the power operation of branched chain amino acids. Amino Anabol strongly inhibits catabolism of exercise and exercise-induced significantly enhances muscle protein anabolism during the post-workout regeneration, improves the glucose metabolism in skeletal muscle, reduce fat in the body and increases the tolerance of the nervous system to prolonged physical effort. Use 5 capsules 20 min. before training and 5 capsules immediately after training. Use 5 capsules immediately after awakening on an empty stomach. Składniki: l-leucyna (42%), l-izoleucyna (21%), l-walina (21%), żelatyna wołowa (kapsułka), substancja przeciwzbrylająca: sole magnezowe kwasów tłuszczowych, amid kwasu nikotynowego, D-pantotenian wapnia, chlorowodorek pirydoksyny, cyjanokobalamina, barwnik: dwutlenek tytanu (kapsułka). Do poprzedników - wielkość porcji nie powala, ale to już inna kwestia. Dobrze działa, sama jakość nie podlega dyskusji. 10 kapsów to 2 porcje.. tak czy siak..pomijając ten aspekt.. jeden z ciekawszych produktów na rynku. 10 kapsułek to jedna porcja - to chyba jakaś kpina ! A sensational, branched-chain amino acid formulation whose leucine content has been significantly elevated. The remarkable BCAA ratio of 20: 1: 1 translates into a significant improvement in their anti-catabolic, but also anabolic properties! Great taste and good solubility of each serving. BE BACK BEFORE YOUNG! You will not find as refined products around-training. Advanced call BCAA and effective doses of L-Glutamine and Citrulline Malate! Amazing effects and the highest quality. Recommended yourself Damian Janikowski! Trec BCAA X Tank - 120 kaps. Comprehensive BCAA formula that will provide not only protection against unwanted catabolism but also will help your recovery be performed at each workout "110%"! The optimal ratio of high-quality amino acid 2: 1: 1.